Coin experts Stack's handled the sale on behalf of the U.S. Mint, which had to give permission for the 1933 $20 Double Eagle to be privately owned. The bidding, which started at $2.5-million, lasted about 10 minutes and the coin was bought by a telephone bidder. 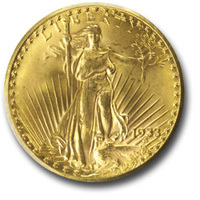 Minted in 1933, the Double Eagle disappeared after president Franklin Roosevelt took the United States off the gold standard and ordered thousands of the coins destroyed. It surfaced in Cairo in 1954 at an auction of deposed Egyptian King Farouk's possessions, only to disappear again for 42 years. In 1996, it was seized in New York as British coin dealer Stephen Fenton tried to sell it to Secret Service agents.